I’m so ready to break free of winter — from both the brutal cold weather and the heavy dark brews. But Old Man Winter has got a death grip on me and just won’t let go. Thankfully the brewers are cooperating — I’m sampling spring brews while there’s six inches of fresh snowfall on the ground. An easy-drinking India Pale Ale with a dry, refreshing finish. I love the description of this Brown IPA from Smuttynose: Big, Brown and Hoppy. You never know what Mud Season is going to throw at you, so we brewed a beer that covers all the bases. We took the malty notes of a brown ale and balanced them with the hop aroma and flavor of a double IPA. Now we’re talking Durty. A refreshing, easy-drinking Golden Ale brewed with honey, hibiscus and chamomile. This self described India-Style Pils Lager is from Otter Creek’s Brewmaster Mike series. Brewed with Citra hops and 100% positive vibrations. Brewed in traditional Kölschbier style, this beer has a clean, refreshing flavor profile, with flavor notes from the use of lemon rind and ground peppercorns in the brewing process. Wandering but not lost. This rye beer is an interesting take on an American Pale Ale. Falling between winter, with its heavy winter warmers, and summer, with its light wheat beers, spring is a flexible beer drinking season. Spring beers span the styles – each of the six beers I sampled represented a different style. I built this custom six-pack at Total Wine hoping that drinking spring brew will be pleasing to the weather gods, Old Man Winter and Mother Nature. 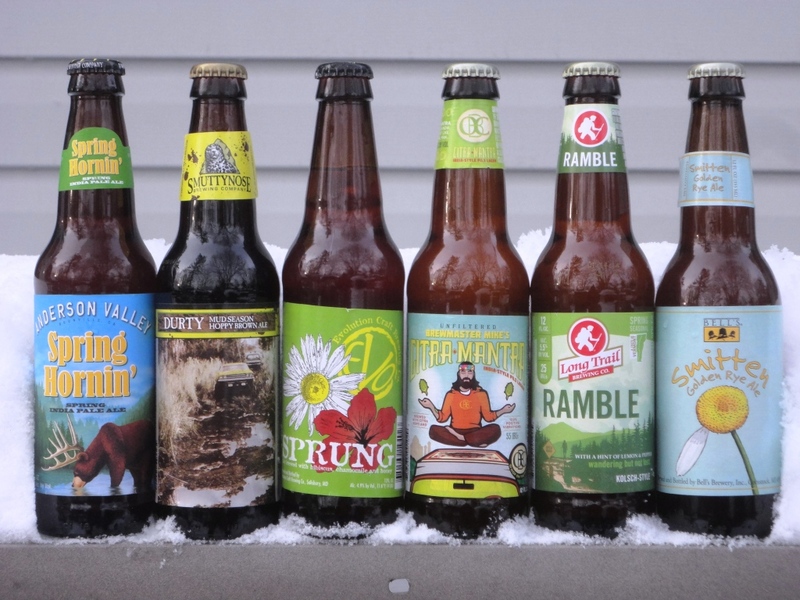 I love the juxtaposition of the spring brews and the snow in your picture. Bring on the spring beer, but also save a few heavy dark brews for me!